On a sunny day in Salt Lake City, Utah, I was preparing to pack all of my belongings up into storage once again, for a voyage to only God knows where. I had recently come back to town to do this from the heart of the south: Atlanta, Georgia. On Sunday April 13th, I had gone down to Turner Field in Atlanta to see a good match up, one would think between the Braves and the Washington Nationals. Sitting first baseline, right behind the rain tarps, I had some solid seats to see Gio Gonzalez against Aaron Harang. All the hype around the Nats this season again, with young superstar Bryce Harper, a star pitching staff and the, on paper, best line up in the National League. It was 80 degrees, sunny, and a great afternoon for baseball. Fans were piling in and I was looking at Harang’s start to the year thinking it was a fluke, for a vetran right hander who wasn’t in the team’s, or any team’s outlook heading into the offseason for this season. I looked at the line up the Braves were putting out, no Gattis, no Uggla, no Johnson – I figured this was going to be a butchering. It was, however, on this day, the Braves proved again why, along with the St. Louis Cardinals, they are not to be taken lightly, and they are a pre-eminent organization in all of baseball. The Braves have recently locked up young stars Jason Heyward (2 years/$13.3 million), Andrelton Simmons (7 years/$58 million), and super star Freddie Freeman (8 years/$135 million). If you pair this up with unlucky and very much injured pitchers Mike Minor, Brandon Beachy, and other young, solid players including 2014 opening day starter Julio Teheran, all-star closer Craig Kimbrel (4 years/$42 million), power hitting catcher Evan Gattis and all-star left fielder Justin Upton (only 27 years old and locked up). One of the best group of young studs placed together in a very long time in the majors, and one that was living up to the hype (please see the Arizona Diamondbacks, any of the last three to four seasons for ones that didn’t). On this day, Bryce Harper lived up to his hype going 2-2 with 2 BB – seemingly the only hitter that could have touched Harang on this day (Harang dominated on this start and was throwing a 7 IP no hitter in his next start). The Braves however had their young stars going nuts with the bats. 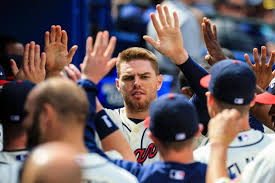 Freddie Freeman lead the way with a 2-run HR and 4 RBI, with Justin Upton and Andrelton Simmons also going deep. The Braves made it seem like a garage sale with the number of extra base hits they had off of Gio Gonzalez. All the talk always seems to be centered on the St. Louis Cardinals for their player development and continual barrage of quality major leaguers that come up through their system, but not enough due diligence is given to the Braves. They demolished their divisional rivals this day, convincingly with multiple bench players in starting roles, and a starting pitcher that couldn’t find a permanent home until a multitude of injuries hit the Braves rotation. The interesting potential of the Braves young players is tremendous. 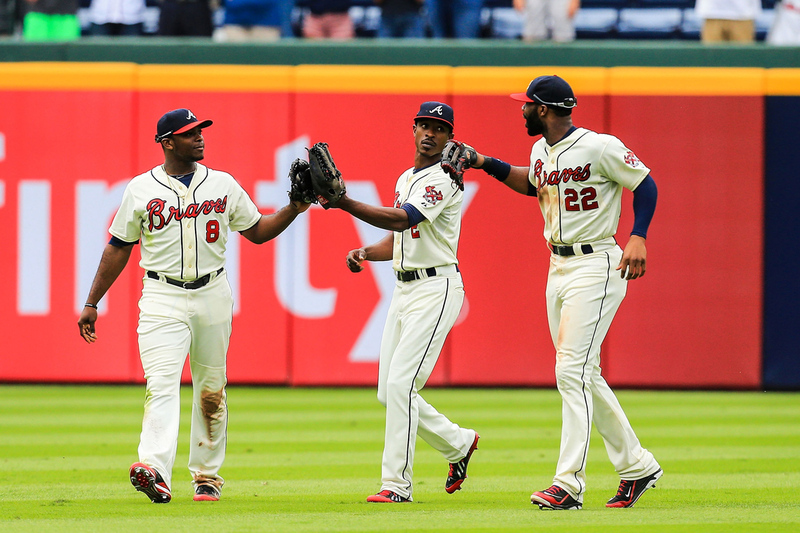 While the impact of power hitting players has gone down in the wake of the MLB PED scandal, the Braves seem to be flourishing with them between Evan Gattis, Justin Upton and Freddie Freeman. Andrelton Simmons is always heralded as a glove first player, but his continued development with the stick, could make his extension to be a steal, and potentially a contract that will be a model for those that come in the future. Freeman is entering his age 24 season and Justin Upton his age 27 season. Andrelton Simmons had a dWAR of 5.4 last season and is also entering his age 24 season. The start of this season saw stud starts from Freddie Freeman and Justin Upton, carrying the team to a MLB best start of 12-5. According to MLB.com’s stat page, the Braves have four of their core young studs all putting up an OPS of at least .837 and dominating opposing pitchers. Not to mention that the worst of their starters is boasting a 1.93 ERA (that being opening day starter Teheran). The Braves currently rank #24 on Baseball Prospectus’ top organizational rankings of 2014, and with no doubt it being ranked so low due to the number of players on the Braves MLB roster that have recently come out of it. Flip side of a coin: One could only imagine if the Braves didn’t pull the trigger on the Mark Teixeira trade of 2008, their line-up would include SS (or probable now 2B) Elvis Andrus, starting pitcher Matt Harrison and catcher Jarrod Saltalamacchia (and Elvis Gattis would be in LF – Justin Upton to CF – and they would have saved millions on the National League allergy that is B.J. Upton). The Braves look to be setting up another decade long vice grip on the National League East. 2014 looks at least to me, like the year of the Braves. While hot starts from Freeman and Upton, whom both have OPS over 1.000, have evened out slow starts from Jason Heyward (and hopefully B.J. Upton), all should continue to come together for the Braves to keep plowing through National League opposition. 2014 is the year of the Tomahawk, as the Braves look to be the odds on favorite at this point to come out of the National League. "George" graduated from Mount Saint Mary College, located in Newburgh, New York in 2006. George has studied SABRmetrics for years and is an a avid baseball and sports fan. He's a fan of all things Boston, none more than his beloved Red Sox. Only he, Tom and Mike know why Mike puts his name in quotes as often as he can. He has been published in "Bleacher Report," and can be seen bi-weekly on the SportsZone with his editorials.